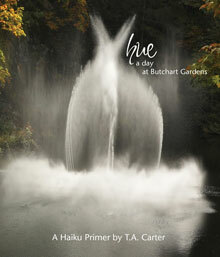 Another success from Leaf Press – from the cover photo of the Dancing Fountain & the bright orange endpapers to the signature emblem framing the poems on each small page – Hue: a Day at Butchart Gardens is beautifully produced. Terry Ann Carter is the author of five lyric poetry collections & four haiku chapbooks. Lighting the Global Lantern: A Teacher’s Guide to Writing Haiku and Related Literary Forms (Wintergreen Studios Press, 2011) is found in many Canadian classrooms. She is the current president of Haiku Canada. In this delightful haiku primer, Terry Ann includes background information, references & sources for haiku, as well as the gardens. It reads believably as one side of a correspondence between Terry Ann & a younger, internet-savvy reader named Lucy. It is instructive, encouraging & informative without condescension. Alternating prose & examples of poems, many different styles of haiku are mentioned, including concrete poetry, one-line haiku, senryu & haiku sequences. I can hear Terry Ann’s voice throughout – natural, honest & clear. She deftly acknowledges the danger in naming some favourite poets (that some will be missed). She also states “…haiku do not contain messages of hope, or faith, or any kind of abstract thinking.” While perhaps good advice for a beginner, this could be challenged by the work of experienced poets, which can break boundaries by being more experimental. Does Lucy exist? In the end, much like questioning a poem written from actual events versus one written solely from the imagination, it does not matter with a result such as this. Highly recommended.